It’s important to understand the basics of human resource operations. However, the traditional approach to human resource management has been replaced by a more strategic, future-oriented approach. The good news is that there are technologies to help manage many of the day-to-day work related to payroll, benefits, and other transactional HR activities. This article provides the essential knowledge you need to understand human resource management, and also includes expert information about applying strategy to HR management, trends, free templates and tools, and Human Resource Management organizations, conferences, and publication resources. What Is the Meaning of Human Resource Management? Human Resource Management is central to any organization, and it’s about far more than just hiring and firing employees. In forward-thinking companies today, Human Resource Management focuses on the recruitment, direction, and management of human assets, and making strategic plans for the future. Strong Human Resource Management nurtures human talent so employees can become even more valuable to the business. 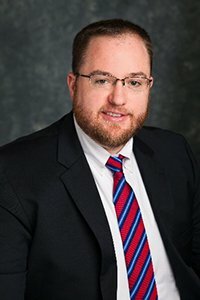 Matthew Burr is the Moderator of the Upstate HR Podcast and Principal at Burr Consulting, LLC, a human resource consulting firm. He says that more than ever before, strategy and planning are integral to successful staffing and support of long-term organizational goals. Human resources managers in major companies are involved in strategic decision making and actively participate on organizational strategy teams. Most consider strategic planning to be a significant component of their role. To become a leading organization themselves, medium-to-small companies should consider adapting to this contemporary model to meet growth goals. To learn more about the next wave in HR, take a look at Welcome to the HR Revolution: Strategic Human Resources Management. The ability to plan for the right workforce has never been more critical or more difficult than today. Technology, communications, and an accelerated rate of change mean that companies and their human resources arm need to be open-minded, nimble, and ready to make the shifts that will keep them competitive. A skills stability report by The World Economic Forum predicted that three years from now, one third of jobs will require skillsets that aren’t crucial today. So how do you plan for what’s to come while remaining competitive today? Successful strategy execution will require that you forecast based on in-depth research to understand what roles will be needed in the future. Do Your Research: You need to stay abreast of the competition and technological advances that will affect your business. Profile Based on Organizational Objectives: Write job descriptions based on your company’s strategy needed to win at a three to five year time horizon. Know Your Human Capital: Assess your current team and identify gaps. Hire Now: Start closings gaps — now. For a closer look into human resources planning and processes, including free templates, check out this article Use Human Resources Planning to Forecast for (Less) Risky Business. Labor management has been practiced for thousands of years, and large-scale projects like China’s Great Wall or dikes in the Netherlands wouldn’t have been possible without labor process coordination. However, the significant changes that led us to human resources as we know it today began in England around 1760. 18th Century - “The Welfare Officers:” The Industrial Revolution of the 18th century shifted economics from agriculture to factories and required organizations to show absolute results for effort, relate them to costs, and sell them competitively. It also required a system to hire, pay wages, record employee work hours, and provide housing and health care. Worker oversight was managed by Welfare Officers or the Welfare Department. 19th Century - “Personnel Management:” Business and factory expansion led to a labor shortfall. Employees worked long hours under difficult conditions. To look for a solution, scientific ideas were applied to increase labor outputs, specifically the Scientific Management Theory advocated by Frederick Taylor related to Personnel Management. 20th Century - “Human Resource Management:” Elton Mayo’s Hawthorne Studies disproved Taylor’s Scientific Management approach to increasing productivity, and found that the primary drivers of motivation and productivity were not monetary factors. A host of new theories emerged based on this behavioral perspective and the term human resource management came into use. 21st Century - “Strategic Human Resource Management” and “Human Capital Management:” The increase in technology- and knowledge-based industries is intensifying global competition. At the same time, there’s a shortage of workers with appropriate skill sets. Consequently, many organizations have adopted strategic human resource management practices to make a long-term impact on corporate success, and refer to their human resources activities as human capital management. The evolution of human resource management also led to a new sub-practice: talent management, a business strategy that anticipates required human capital. 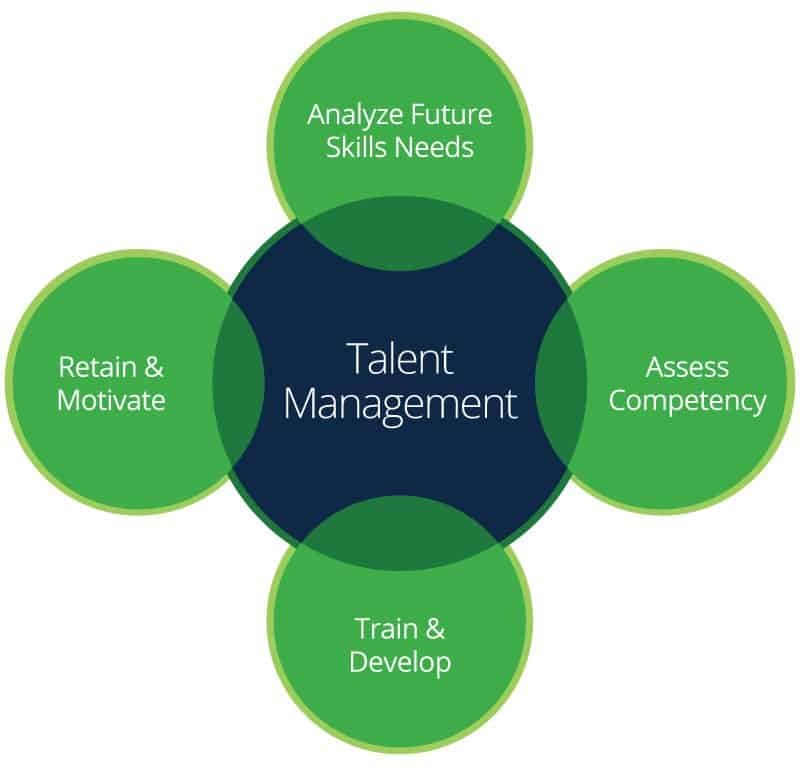 Talent management is about engaging highly specialized, highly skilled people to retain them for the long run by understanding future skills needs, assessing competencies, training and developing employees, and keeping them on board and motivated. Improves Productivity: To seek out and hire a better class of employee is where all businesses need to start increasing their productivity — this falls to HR departments. HR departments not only recruit and interview potential candidates, but also pick out the standouts and leave the rest. In cooperation with other managers, human resources managers should build a benefits menu to attract ‘rock stars’ and develop a hiring process that targets motivated, productive employees. Reduces Costs: “For every $10,000 in the salary of a key employee who decides to leave,” says Remley, “the company loses approximately six days of productivity.” Keep turnover low with ongoing employee satisfaction surveys and non-monetary benefits. Another retention tool is training and mentoring, which reduces turnover and internal strife. Managers can also cross-train team members so they can capably fill in when colleagues are on vacation or ill.
Strengthens Brand: Top brands tend to top lists of the best places to work. Powerful brands attract powerful talent, but they are also built by powerful teams of talented individuals. Employees who are engaged are more productive and less likely to quit. They can also become brand ambassadors for your company and a recruitment source for new hires. Enables Financial and Intellectual Company Growth: Human Resources must be able to facilitate strategy execution by building and sustaining organizational capability. This role cannot be automated, outsourced, or offshored: It comes from inside knowledge of a business’s strategy and the existing company capabilities. It includes maximizing employee performance in service of the company’s strategic objectives, preparing for current and long-term needs, and listening and responding to employees. It may also consist of re-engineering organizational processes. Every strategy is executed by people who are trained, supported, and equipped to fulfill the company’s strategic vision. Manages Transformation and Change: Creating a company that is adaptable to market shifts includes effective communication with team members to ease job security concerns during periods of change. It’s a necessity: Change is the new constant in everyone’s work environment, everywhere. A typical organization has had five major changes in the past three years. Most change success factors relate to talent, which means human resources faces increasing pressures. Learn more by reading the Essential Guide to Everything Change Management. When change is necessary, having a template to help get you started managing the details can make the difference between a successful transition, and one that leaves your team frustrated. 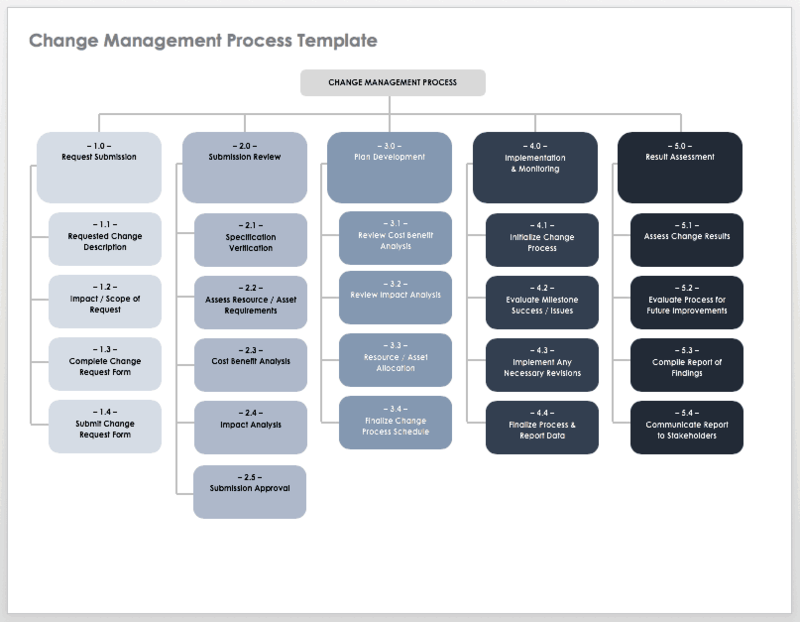 Use the template below to show your change management process, from request flows to measuring and reporting outcomes. You can include this tool in your change management plan for a visual representation of the process. Showing a breakdown of each step helps to simplify the process and provides a snapshot view for easy reference. If you’re looking for other change management tools, download these additional proposal, communications, assessment, and policy change management templates. Today’s HR manager has several roles: an employee advocate, change manager, and strategic partner. They are also responsible for managerial, advisory, and a wide variety of operational functions. Doing the job well involves leadership, an ongoing investment in training of team members, and a solid understanding of the company, its brand, obligations, and goals. Advise: The human resources manager is an expert in their area and should advise on matters relating to human resources to the C-suite and departmental heads, including the formulation and evaluation of programs, policies, and procedures. They also give advice on fostering strong employee relationships and high morale. Additionally, the human resources manager advises on job analysis and design, manpower planning, recruitment, and selection — everything related to managerial and operational functions of HR. Strategize: Alignment to organizational business strategy means that human resources can anticipate and maintain a competitive advantage and better respond to customer needs. The execution of successful business strategy relies on meticulous research, planning, and the promotion of appropriate behaviors, workforce culture, and competencies. Get started creating a detailed strategic plan for your HR organization with a pre-built template.Or modify the template to focus on one specific area, such as employee relations or recruitment. 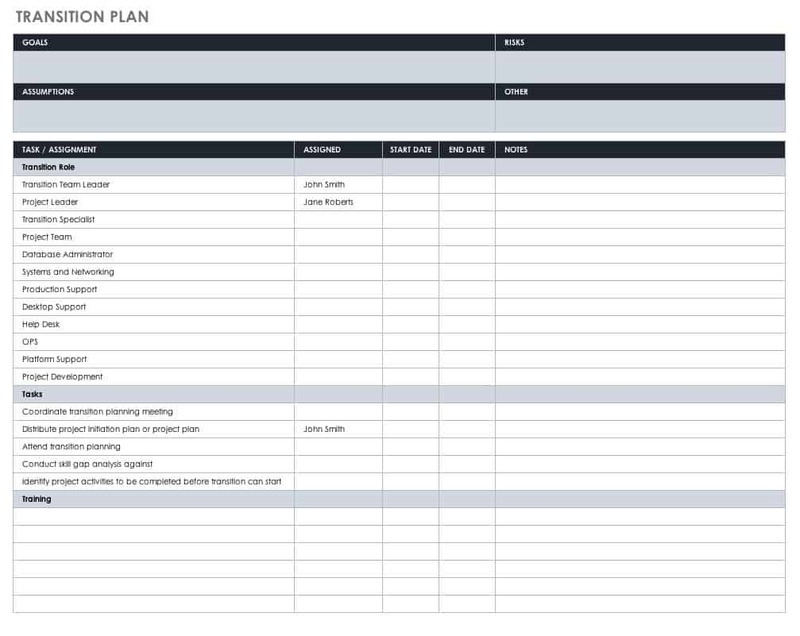 This simple layout makes it easy to quickly view key information and generate measurable action plans based on organizational goals. Plan: “Talented people will always have options,” says Burr. “HR planning plays a significant role in supporting strategy.” HR planning ensures a good fit between candidates and jobs while avoiding personnel surpluses or shortages.The main aspects of HR planning are analyzing the current labor force, forecasting demand, balancing projected labor demand with supply, and supporting organizational goals. Organize: Once objectives and programs are established, and there are plans to achieve them, the HR manager designs and develops structures to complete the designated operations. This involves grouping activities functions or positions, assigning different tasks to individuals, delegating authority, and coordinating the activities of the appointed individuals. Direct: The direction function of the HR manager involves encouraging people to work effectively and willingly for the goals of the enterprise and to clearly state tasks and processes. Motivation can spring from training, benefits, perks, and improving the physical and emotional work environment. Control: Control involves the observation and comparison of results with the standards and correcting any deviations. Control requires performance appraisals, critical examination of records, statistics, and employee audits. The day-to-day administrative functions are as essential as the advisory and managerial components they support. 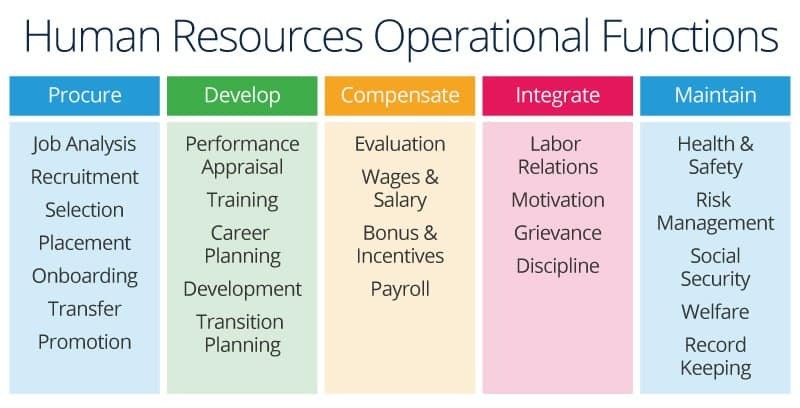 To help better manage the operational tasks, take advantage of free human resources templates. Job Analysis - A clear understanding of the jobs you need now and in the near future to meet company goals, what those job functions are, and the profile of the ideal candidate. Recruitment - Attracting candidates for any role will likely require multiple tools, from job boards, social media, word of mouth and bonuses for referral, and recruiting from within the organization. Recruitment is one of the top responsibilities of any human resources team. Searching for, vetting, and finding the right talent to join your team is crucial to ensure the success of your organization. With a staffing plan in place, your team will be able to access recruitment sources, hiring goals, and more. 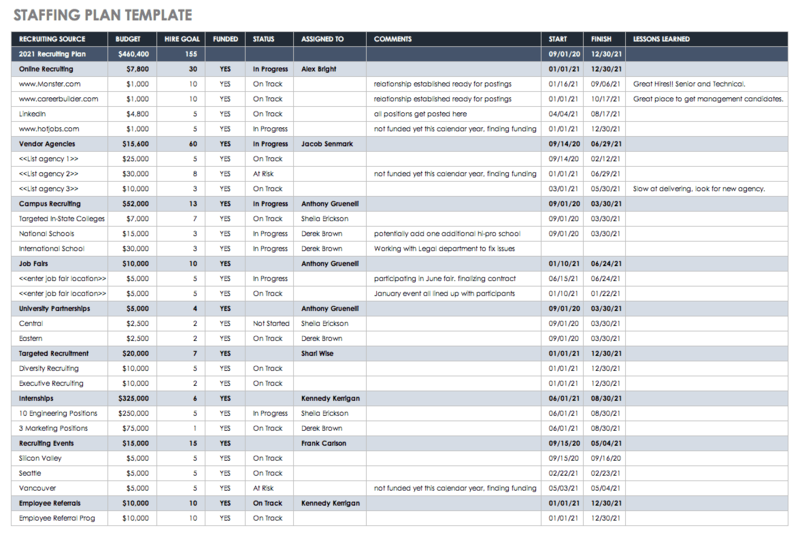 This staffing plan template will help you to organize all of the details with columns for budgets, goals, status, and comments. Selection: Once a pool of candidates is selected, their applications will need to be reviewed and honed down to a small group of individuals who fit your criteria. They are then screened, usually through a phone interview. After screening, the list is honed down to a select few for in-person interviews. That process and the number of interviews vary depending on the size of the company. Placement: This is the hiring process: The offer is extended and the applicant either accepts or counter-offers. Onboarding: A comprehensive onboarding process is perhaps the most crucial step in the recruiting process, as it helps candidates and new employees understand and embrace the culture and feel welcomed by the team. Onboarding is more than paperwork and knowing where the coffee is made: It’s about making new team members feel comfortable even before they officially join the organization. Many companies fail to do that, and their new employee never shows up for their first day of work. 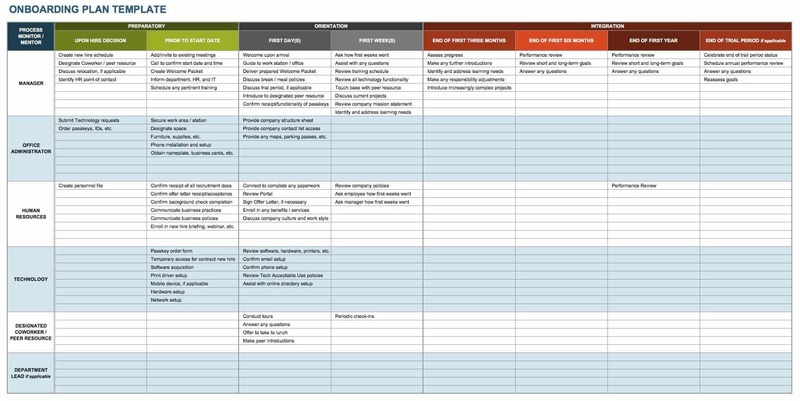 Use this template to plan which onboarding activities to complete at each stage and by whom. Contacts are included in the first column. 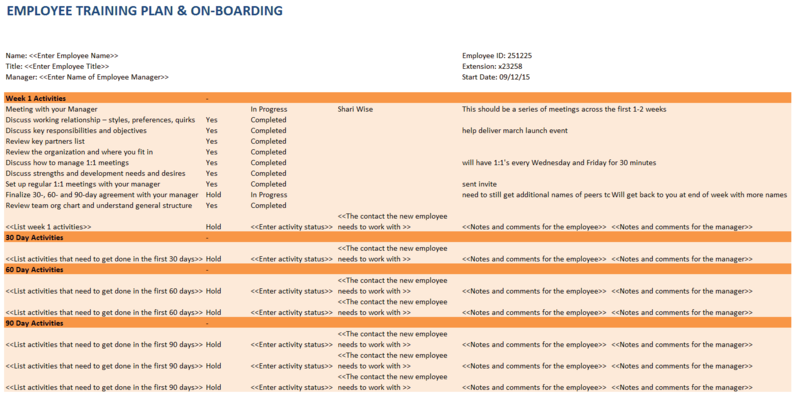 The rest of the spreadsheet shows the onboarding tasks assigned to each contact over the course of 12 months. Change the template as needed to create your own comprehensive onboarding plan. Learn more about onboarding and download more templates at Employee Onboarding Processes: Plans, Best Practices, Flowcharts. Transfer: Team members may have skills that apply to multiple areas of the company. A work transfer is a way to help an employee gain broader experience within the company and is an integral part of talent management and planning. Performance Appraisal: It’s essential for employees and employers to understand how well individuals are doing in their jobs and what can be done to improve performance. It is not only important for the employer to evaluate their employee, but increasingly there is importance placed on the employee evaluating their manager or employer. This is called a 360 performance appraisal. 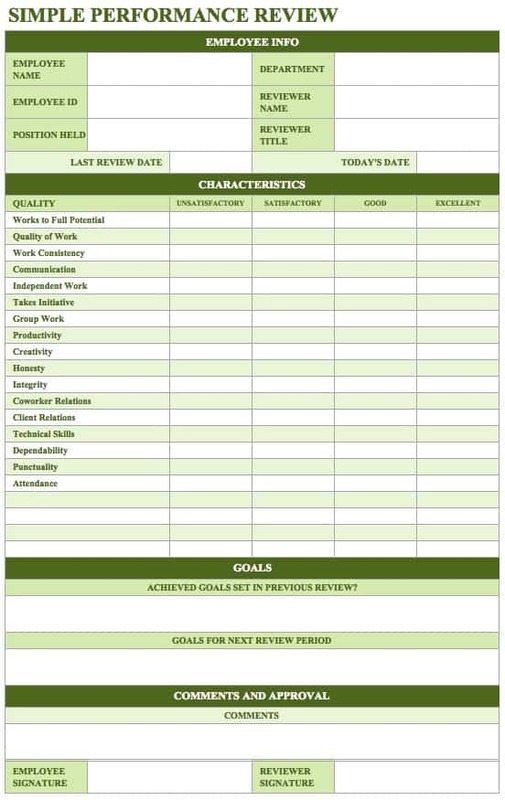 This performance review template offers the basics: a list of employee skills and qualities and a rating system, from poor to excellent, to provide a snapshot of employee performance. It can help guide a productive conversation between team member and manager. There is also a section to note future goals and significant accomplishments. Training: Helping employees learn how to do their job in alignment with how the organization wants it done requires training. There may be specific skills refreshed or learned. Providing opportunities for team members to attend online seminars or classes benefits the company and improves morale and engagement. Career Planning: Effective Human Resource Management covers career planning, development, and succession planning. An organization without career support initiatives can expect a high rate of attrition. Development: Upgrading existing skills and knowledge of employees is of utmost importance for employees to keep themselves involved in their jobs and for the company to survive fierce competition. Transition Planning: A successful company is one that continuously evolves to meet the challenges it faces, one such challenge is employee turnover. Developing a generalized transition plan can help you prepare for employee departures. You can also design a plan to prepare for an upcoming changes or transfers. This easy-to-adapt transition plan template will help you and your team prepare for changes in your organization. You can track different tasks, assign them to team members, and check to see if you’re meeting deadlines. Evaluation: Compensation evaluation includes more than paycheck income. It also includes cost of living calculations, costs of healthcare, and the impact of state income taxes. Wages and Salary: Wages are hourly, daily, weekly, or monthly payments to employees. Salaries are flat rate payments to upper-level employees whose contribution cannot be measured easily. Compensation includes payments plus benefits such as vacation, housing, travel, and privileges. Bonuses and Incentives: Bonuses and incentives reward team members for outstanding performance. Bonuses recognize exceptional contributions and sustained outstanding performance. Incentives recognize specific goals that are accomplished and were formally communicated at the beginning of a project or performance cycle (these include goals and target award amounts). Payroll. A payroll is an employee list, but the term also refers to the amount of money paid to personnel, including bonuses, incentives, and taxes withheld. 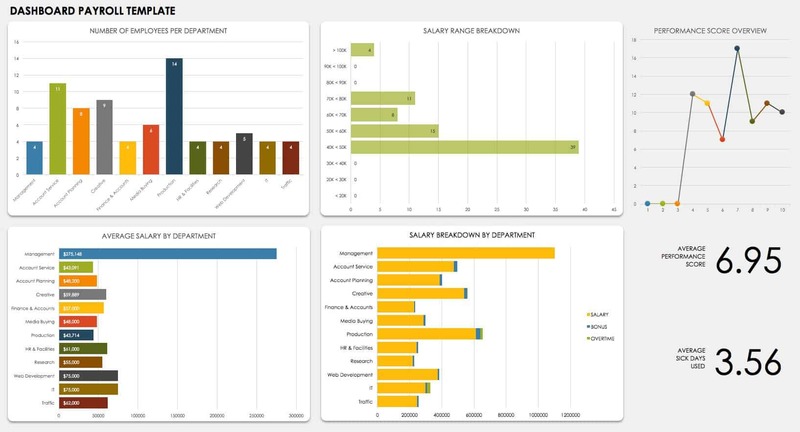 Creating a payroll report template with a graphical data display highlights your most important data. This dashboard shows a quick overview of metrics and compiles a range of information into one report. This template offers a mix of graphs and charts for reviewing and managing payroll. Labor Relations. Bridging gaps between management and staff is crucial to a healthy organization. Different forms of intervention can be used including mediation, counseling, training, and problem-solving to protect rights and facilitate a more harmonious work environment, including union negotiations. Motivation: Employee motivation is the level of commitment, creativity, and energy team members bring to their jobs. It’s a mix of fulfilling expectations, needs, and factors in your workplace that enable employee engagement. Work environments should be designed to be fair and supportive, and employees should feel empowered to make a contribution to the enterprise. Grievance: A grievance is an assertion claim by an employee that they have been negatively affected by the misinterpretation or misapplication of a written company policy or collective bargain agreement. Be prepared and have grievance procedures in place and ready to implement. Discipline: The most common infractions that require disciplinary action include poor attendance, dress code violations, insubordination, and discrimination or harassment. Human resources professionals should have a plan in place to address the most common disciplinary infractions. To discipline an employee, supervisors should have a well-crafted disciplinary policy to enforce, and precise documentation. 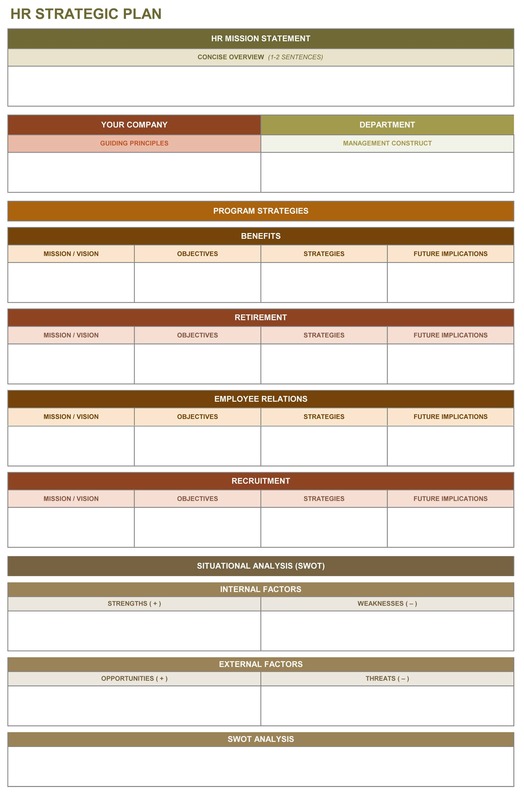 Use this template for non-violent incidents, such as disciplinary issues or accidents. It provides space to describe the nature of the event, disciplinary actions taken, the employee’s position, and their supervisor’s information. 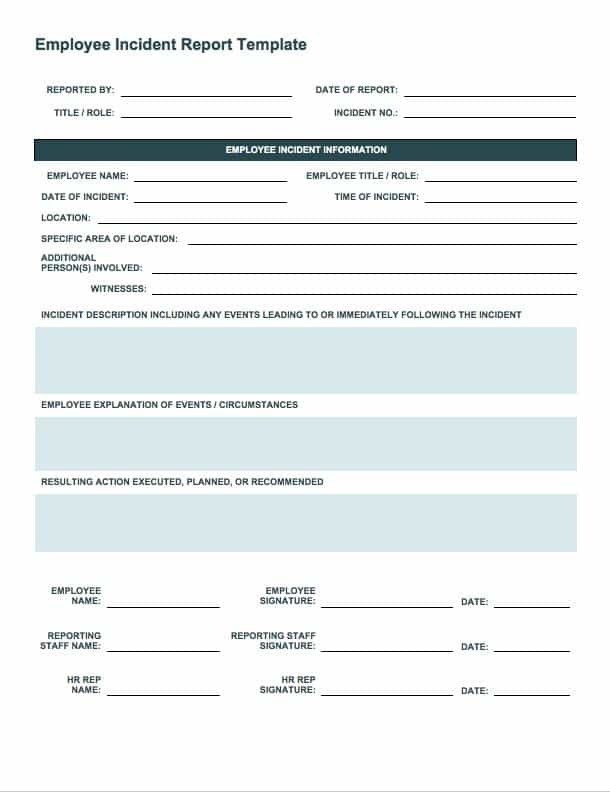 In case of an accident, this form may be used to capture information about injuries and medical treatment, workplace equipment involved, and witness information. This form may also be used in workers’ compensation claims. Health & Safety: Human resources plays a vital role in ensuring personnel health and safety. It’s up to HR managers to set policies that utilize all possible resources to create and maintain the health and safety standards for their team. Risk Management: There are two aspects to risk management. The first is people, who are themselves a risk because of employee shortages, below-average performance, or a key employee quitting after considerable investment in training and development. Second, people deal with risk by solving problems, extending themselves for the good of the company, redesigning their job for greater efficiency or recruiting a former colleague who has a skill urgently needed by the company. Welfare: Employee welfare includes various benefits, services, and facilities essential for the team members’ well-being. Employers are legally required to provide essential amenities such as toilet facilities and clean drinking water for employees. Policies can also include other items such transportation, housing, medical insurance, and food. Recordkeeping: Federal laws require employers to create and keep various forms of employment records — failure to follow those regulations usually involves monetary penalties. In some cases, there is individual and criminal liability. Proper maintenance of employment records is crucial in the case of employment-related litigation. Human resources is responsible for keeping full records of employee achievements, promotions, training, and more. It also preserves records relating to behavior such as absenteeism, turnover, programs, and policies. Most employees are more successful in their jobs with additional training. Though the necessity and duration of training can be different for every organization, having a plan in place supports team member satisfaction and retention. This training schedule template helps you track activities, add details needed to complete each task, and provide valuable feedback for the employee and manager. Policies are the formal guidelines and rules companies establish to hire, train, assess, and reward team members. Having policies written and shared in an easy-to-understand form can preempt misunderstandings between staff and employers about rights and obligations. Regulations are the laws at the local, state, and federal levels that regulate staffing conduct. The most important of these covers affirmative action, equal opportunity, and sexual harassment. Operating from Clarity: Written policy and regulations mean that managers at every level can make decisions without consulting superiors, and that team members must accept responsibility because policies clearly define expectations. Supporting Uniformity and Consistency: Established policies ensure uniform treatment of all employees throughout the organization. It creates consistency in the application of the procedures, so that everyone in the company receives fair treatment, follows set patterns of behavior, and works more confidently. Preventing Bias: A written policy and guidelines manual minimizes any personal bias and mismanagement or manager misbehavior. Saving Time: Prompt action for making decisions is ensured because standards have been set. They prevent the waste of time involved in repeated analyses for solving similar problems. Curbing Litigation: Making sure that regulations are shared and followed by everyone in the company can prevent expensive legal action and damage to the organization’s reputation and brand. Recruitment: The process should be transparent and unbiased to result in hiring the best team members, based on merit and alignment to your company’s goals, values, and philosophy. EOE Legal Compliance: This is not a ‘should do,’ it’s a must. Compliance with the law is the responsibility of every employer and employee. Compensation and Benefits: Total compensation should include base salary, incentive or plans, non-cash compensation, and benefits. Time Policies: Work schedules, breaks, holidays, sick days, and personal leave should be defined. Performance Evaluations: Employees who excel should be recognized, and struggling employees should have the chance to succeed while still being held accountable for less-than-stellar performance. A two-way conversation can help determine whether the employee has been given the resources and tools they need to be successful, and address failures to meet specific performance or behavior related concerns. Evaluations can lead to improvement in overall performance, the recognition of training or skills gaps, or possible employment actions demotion, transfer, or termination. Assessments are also useful for new employees as a tool to communicate performance expectations. Termination: Employers should develop standard procedures governing voluntary and involuntary employment termination. Adopting and closely following set policies and procedures reduce the risk of employee legal action and ensure your company’s compliance with related state and federal statutes. Because of the many legal issues surrounding termination, employers should consult with an experienced employment counsel. Every manual will be different, depending on company size, business type and model, and more. To begin the process, use the following checklist to check off all the items that can or should be included to in your employee manual. Keeping track of and executing on policies and procedures can be challenging. A human resource management system is a software application that automates and integrates many of the policies and HR functions, such as benefits administration, payroll, recruiting and training, and performance analysis and review into a single system. This makes most of the day-to-day processes less time-consuming, trackable, and tedious, freeing up more time to devote to higher-level management concerns. The cost of human resource management system in a one-time payment version can range from a few thousand dollars to the $100,000 range for enterprise versions. SaaS software pay-by-employee or user versions can be far less expensive, with an average of $10 per month. It may make sense for all company departments to weigh in on goals and options before a buying decision is made. Human resource management demands a high level of interpersonal skills, integrity, and dedication to confidentiality. Increasingly, as Burr suggests, to be successful, human resources managers need to understand the business they are working for and the competition. Having an understanding of the business management, finance, and accounting that your employer is engaged in is essential to be effective in your role and strategic in your stance. A degree isn’t mandatory to break into an entry-level human resources position, but the lack of a degree may limit your advancement. A degree in business management, finance, or accounting can be an advantage in today’s business environment. Universities Offering HR-Specific Degrees: Human Resources degrees are offered by Cornell University Rutgers, Michigan State University, Indiana University, Purdue University, The State University of New Jersey School of Management and Labor Relations, University of Minnesota, and the University of Illinois at Urbana-Champaign, among others. Continuing Education and Certification: Professional organizations and larger companies offer workshops and classes to broaden and improve HR skills. Completing a professional certification course often increases advancement and earning potential. Some certifications include Professional in Human Resources (PHR) or Senior Professional in Human Resources (SPHR) designations. Forbes considered HR Management the 6th best job in their 2017 poll of Best Jobs to Apply for in 2017. Depending on the size of the organization, the Human Resources Manager is responsible for every function related to the activities and needs of the company’s people, including recruitment, hiring, training, organization, development, communication, performance management, policy and regulations, salary and benefits, employee relations, and leadership. The Outlook for Human Resource Manager Positions: According to the US Department of Labor, employment opportunities for human resources managers are growing. Although job opportunities are expected to vary with the staffing needs of individual companies, stiff competition can be expected for most positions. Candidates with certifications or a master’s degree in HR are considered to have the best job prospects. 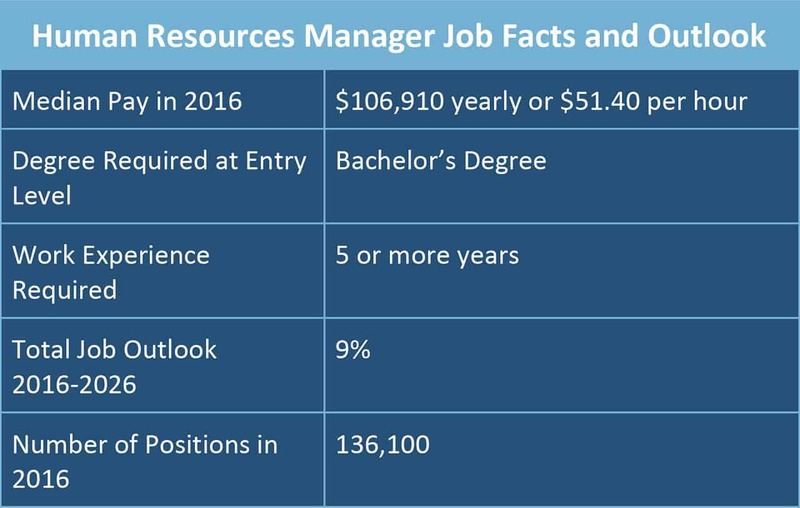 Source: Bureau of Labor Statistics, U.S. Department of Labor, Occupational Outlook Handbook, Human Resources Managers, on the internet at https://www.bls.gov/ooh/management/human-resources-managers.htm. There are career opportunities open to experienced human resources managers looking to advance their careers at their own companies or in new environments, either as full-time employees or as a consultant. Human Resources Director: HR directors are in a leadership position, and supervise and provide consultation and advice to the C-Suite and departmental managers on strategic hiring plans, benefits, compensation, training and development, labor relations, and budget. HR directors take the lead in developing a culture that supports teams members to work in alignment with company objectives. HR directors spearhead initiatives that support strategic goals in human resources-related areas. In this position, HR Directors are expected to lead talent assessment, performance management, and productive labor relationships, including negotiating, and administer labor agreements. Chief Human Resources Officer (CHRO): A C-suite position, the CHRO is accountable for the development and execution of human resource strategy with a focus on talent and change management, succession planning, organizational and performance management, compensation, and training and development. The CHRO articulates HR needs and plans to executive management, the board of directors, and shareholders. Human Resources Consultant: HR Consultants usually fulfill one of two roles. An expert resource consultant designs solutions based on expertise and experience and assists in the implementation of those solutions. A process/people consultant helps search for solutions with methods that increase client company creativity, so they can implement solutions themselves. Predictive Analytics: A data-driven approach to human resources will enable more powerful policies and interventions to understand and prevent employee turnover and help with the forecasting process. People analytics have been in use for about a decade, but their impact and the use of big data will increase in the coming decades. Greater Employee Focus: A Future Workplace and Beyond.com study found that over 80 percent of human resource leaders say that employee experience is fundamental to their company’s competitiveness and success, and that they are making changes to be more competitive in a tight job market, to recruit and retain talent with the right skills. Employee experience includes the culture, physical environment, and technological environment. Applying Agile: The Agile approach used in software development to operate with speed and manage unpredictability will eventually be used in human resources management. For example, “Agile Recruiting Scrum Master” is an HR title already coming into use. Agile will also be applied to learning and development by making it easy for employees to find, rate, tag, and consume learning. Virtual HR: Virtual HR refers to a range of options that connect employees directly with HR systems. This reduces the time commitment of HR staff to maintain the integrity of employee information and the need to serve staff directly. For team members, virtual HR allows them to own their own data, keep on top of training needs and appraisals, and get company news and developments. HR and Social Media: Integrating social technologies into recruitment, development, and engagement is becoming more common. A strong social media presence and strategy helps locate top talent, and online reputation is a must according to a survey by Spherion Staffing. Academy of Human Resources Development: Encourages the study of theories, processes, and practices related to human resources. The site provides useful links, organization info, newsletter, and chapter listservs. Some areas are only accessible to members. American Arbitration Association (AAA): The Association provides Alternative Dispute Resolution (ADR) services. Their site contains rules and procedures, focus areas, publications, arbitrator directory, and links to additional resources. Association for Talent Development (ASTD): A worldwide organization, the group supports professionals who develop the skills and knowledge of employees. ASTD provides books, research, education programs, conferences, and webcasts. College and University Professional Association for Human Resources (CUPA-HR): The organization provides research, trend monitoring, and workplace issues in higher education workplaces, domestically and globally. Members can network, access professional development, resources, and tools. Equal Employment Advisory Council: This nonprofit is an association of major companies committed to equal employment opportunity principles. Members have access to resources and publications. HR People + Strategy: Originally known as the Human Resource Planning Society, this strategic human resource management system Executive network brings thought leaders and members together. It also provides access to discussions, publications, research, and executive-level networking opportunities. Human Capital Institute (HCI): HCI is a worldwide organization with many resources dedicated to driving sustainable competitive advantage in a global economy. 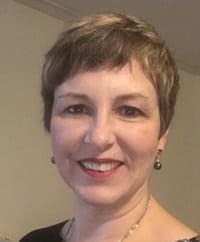 Human Resources Consultants Association: A resource for client companies to find HR consultants in an array of specialties and in a national forum for members. Human Resources Research Organization: An independent, nonprofit organization serving government agencies, the private sector, and professional associations. The organization designs custom solutions by applying technology and science to improve performance. International Association for Human Resource Information Management (IHRIM): An HR system professional association providing expert knowledge that leverages systems, technologies, and analytics for business excellence. Members are offered a job board, research, resource links, and networking opportunities. International Public Management Association for Human Resources: The association provides information and assistance to help HR professionals at federal, state, and local levels of government improve performance with cost effective services, products, and educational resources. International Society for Performance Improvement: The focus is improving human workplace performance through reproducible and systematic means. Resources provided include discussion forums, jobs board, a buyers guide, and journal. National Association of African Americans in Human Resources (NAAHR): A networking and career organization for African American HR practitioners and other aligned individuals. Tips and resources, networking, educational and professional development, job opportunities, mentorship, and coaching are provided. National Employment Lawyers Association (NELA): The country’s largest organization of attorneys who primarily or exclusively represent employees in cases involving workers rights violations. The site provides employment cases, affirmative action facts, disability rights, and other pertinent resources. National Human Resources Association (NHRA): Focused on member leadership skills and career advancement, the organization offers development and networking services nationwide. NHRA supports professional development with live meetings, conferences, seminars, webcasts, and other tools. Recruitment Process Outsourcing Association (RPOA): The organization’s goal is to educate companies and HR professionals about recruitment process outsourcing, develop and enforce certifications, and support the use of common metrics. WorldatWork: The organization is dedicated to knowledge leadership for HR professionals in the areas of benefits, compensation, and total rewards. Worldwide ERC: The organization provides international assignment and relocation leadership and resources to global workforce mobility professionals. The Annual Advanced Employment Issues Symposium (AEIS): Practical guidance for overcoming the latest employment challenges. Employment law attorneys and experts provide information about regulatory changes and compliance obligations. American Society for Healthcare Human Resources Administration: Networking, education, and development for professionals in healthcare human resources. Benefits Forum & Expo: Information and networking for senior level benefits professionals. CUPA-HR Conferences & Symposiums: The College and University Professional Association for Human Resources offers multiple symposia and conferences throughout the year. Elevate Virtual: A free, online conference of over 60 presentations by industry experts, authors, advisors, executives, and thought leaders, plus free downloadable content and Strategic Human Resource Management and HCRI credits. Equal Employment Advisory Council Fall Compliance Conference: Practical information on policy, regulatory, and case law changes that influence workplace compliance programs. Human Capital Institute Events 2017: The institute hosts multiple conferences through the year on various topics including innovation, workforce planning, analytics, diversity, performance management, and more. HR People + Strategy Annual Conference: A forum for HR executives to exchanges ideas and learn from forward-thinking human resources thought leaders with the goals of developing strategies today to answer the issues companies will face in the near future. National Human Resources Association Meetings & Events: Leadership activities, human resources conferences and events, meetings, and networking groups on a wide range of HR and leadership topics. Predictive Analytics World for Workforce: An annual conference that brings employers, data scientists, and vendors together on the use of predictive analytics to solve workforce optimization challenges. University Conference Services: A series of programs focused on the two most important benefits programs for attracting and retaining talent: employer-provided healthcare and retirement benefits. Worldwide ERC's Global Workforce Symposium: A conference which addresses workforce mobility issues and challenges. The HR Director: Focus on senior managers and human resource directors to stay abreast of HR advancements. Human Resource Executive Online: An online publication providing HR executives with the latest information about strategic issues. Human Resource Management International Digest: A compendium of the best HR articles about HR management. Human Resource Management: Bridges research and practice, and features thought-provoking articles on innovative strategies and methods for Human Resource Management professionals. Human Resource Management Review: Scholarly articles cover the main area of concern to Human Resource Management professionals. Human Resources Management Journal: A scholarly journal for the advancement and of HR academics and practitioners. International Journal of Human Resource Studies: A quarterly, internationally refereed journal promoting new techniques and enhancements to current HR techniques and methodologies. Membership in the American Society for Healthcare Human Resources Administration: A quarterly journal for members covering cutting edge advancements in practice and research on healthcare industry HR. Workforce Magazine: A monthly publication devoted to sharing the most successful and innovative HR tools and trends. While building and refining your human resources management program, you’ll want a reliable software tool that helps maximize your productivity and stay organized. Smartsheet is a work management and automation platform that enables enterprises and teams to get from idea to impact - fast. 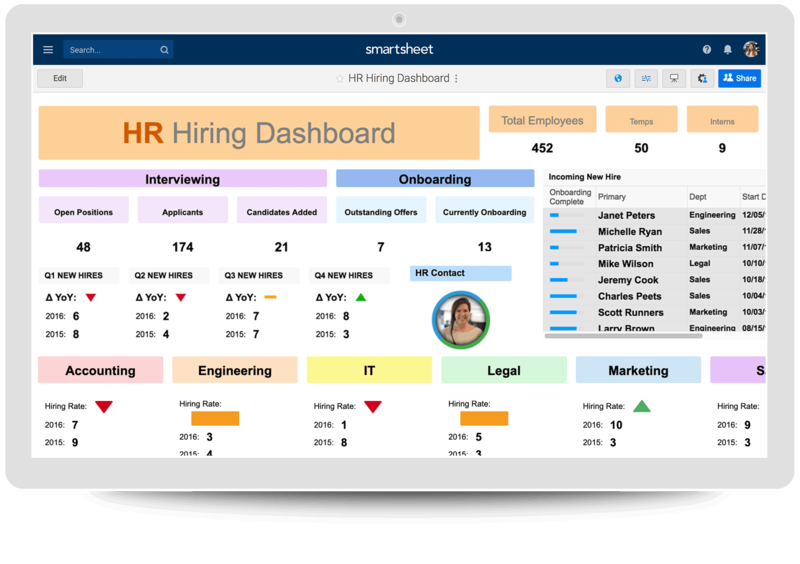 Leading HR professionals rely on Smartsheet to help manage everything from simple onboarding tasks to complex change management, recruiting, and benefits and retirement tracking.